← Jingle in July at City Limits Saloon July 18th! 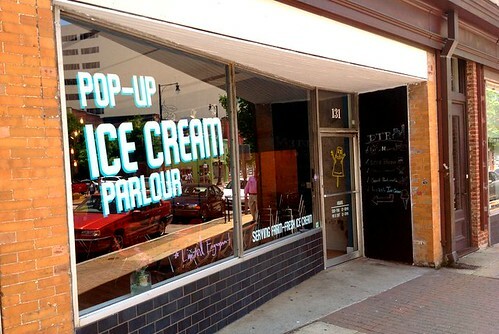 Pop-Up Ice Cream Parlour in Downtown Raleigh! 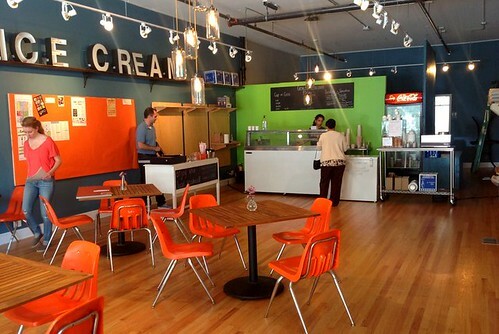 You’ve probably heard by now that a cool Pop-Up Ice Cream Parlour has opened up in downtown Raleigh. 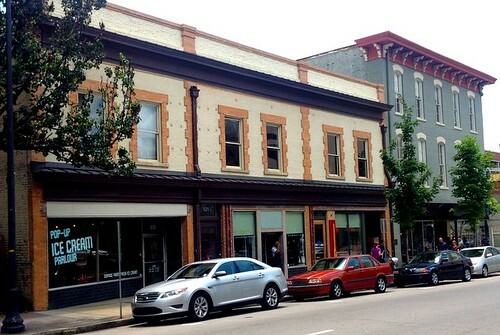 It is located at 131 S. Wilmington Street just north of Hargett Street and right next to the restaurants Gravy and Sitti around the corner from Morning Times. Several of the people I follow on instagram have been posting fun pictures of the parlour so I decided to walk down there on my lunch break a few weeks ago and check it out. Being a “pop-up” style place means it is temporary and will only occupy the current spot until the end of August. Even though it is only temporary they have done a great job with place. It has lots of tables spaced out across the hardwood floor and great lighting. The parlour has a nice open feeling with huge windows at the front of the shop overlooking the busy sidewalk along Wilmington Street. 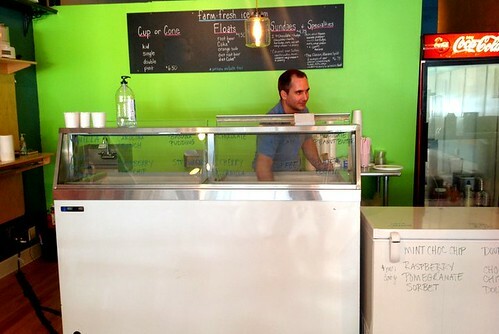 The ice cream shop features locally produced ice cream. Right now the offer ice cream from two local producers but have plans to open their own creamery in the future to sell once they open their permanent location down the road. Given the temporary nature of the shop, the menu is surprisingly inclusive offer a wide range of flavors (14 regular flavors and 4 rotating ones). In addition to traditional ice cream by the scoop in a cup or cone they also have ice cream floats, sundaes and smoothies. 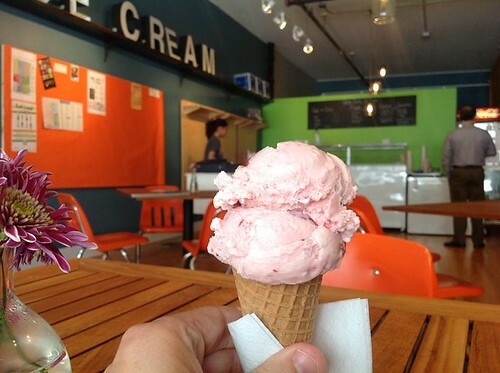 I opted for a single scoop of the strawberry ice cream in a cone and it was fantastic. I live it when strawberry ice cream has large chunks of actual strawberries in it. I was pretty hungry since I hadn’t had lunch yet so I scarfed this cone down in record time, but I had the presence of mind to grab a picture before I made it disappear. Something I’m not always good at! I really enjoyed my visit to the Pop-Up Ice Cream Parlour and was glad I had the chance to visit. During subsequent visits downtown I’ve noticed they have been quite busy so it appears word has gotten around and people are enjoying access to great locally produced ice cream. 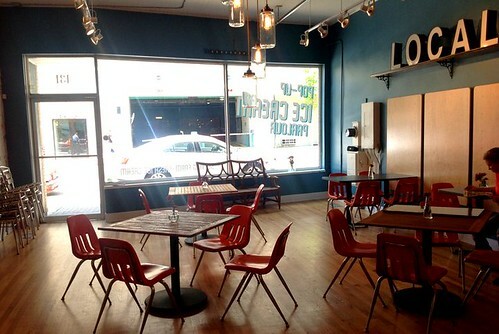 Last week, the news and observer reported that the owner, Laura Suther, is planning to open a second Pop-Up location downtown at 6161 N. Person St. next door to PieBird. This second location is still being negotiated but the plan is to sell ice cream as well as some locally produced items like milk and eggs. The Person street location may become a year-round operation should it prove successful in that neighborhood. I think it will! 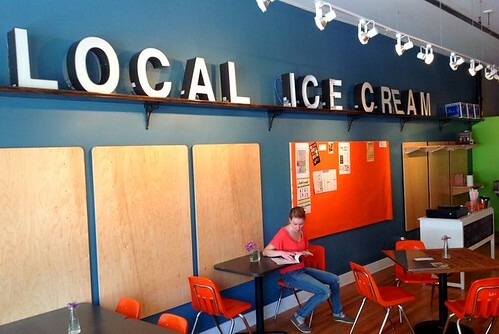 While plans for the second location are being finalized you can continue to get your ice cream fix at the Wilmington Street Pop-Up Ice Cream Parlour through August 31st. Thanks! I’ll check it out on one of my next trips to Raleigh! Awesome. Need to check it out (and possible review)! Thanks Greg. Let me know what you think!